In about 2 weeks, the citizens of the City of Durham, NC will go to the polls. Our primary from a couple of weeks ago showed that less than 8% of the registered voters took the time to vote. Don’t stay home in November! We have 2 local elected positions in November to decide upon — A City Council Seat & Mayor. We must defeat Mayor Bell & Councilman Steve Schewel at all costs. Oct 9 – Schewel introduces a Resolution to welcome ‘Refugees’ to Durham . These are NOT refugees, they are Invaders. The FBI Director, James Comey, even acknowledges this fact . “FBI Director James Comey said Wednesday(10/14/15) the recruitment of potential homegrown terrorists by the Islamic State group is widespread and goes on “24 hours a day” across the United States. September 2015 – The NY Times reports that even the Whitehouse doesn’t know how our system works [5a]. Calling for 10,000 refugees to be admitted to the USA in 2016, yet our ACTUAL process takes 18 – 24 months to vet / verify these individuals before we allow them into our homeland [5b]. 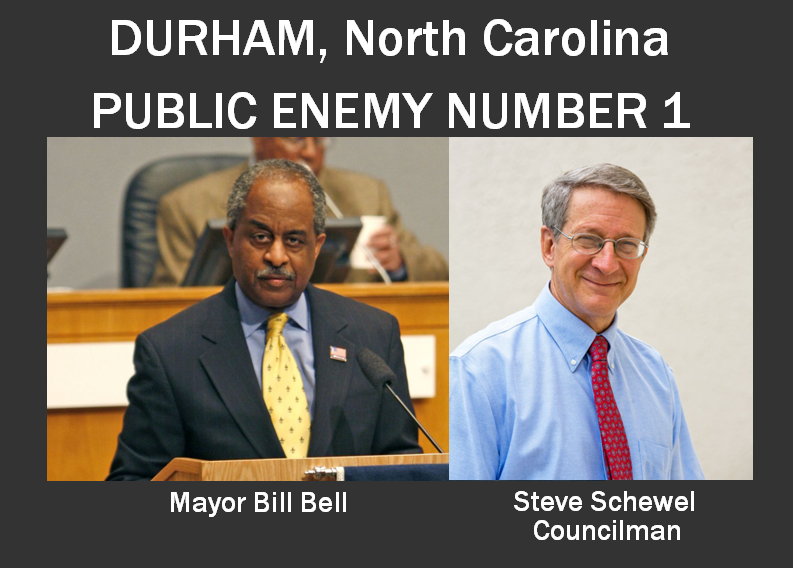 January 2015 – Schewel, Bell, & the City Council approved another resolution to ‘WELCOME’ Illegal Invaders to Durham . Another resolution was adopted back in 2003 making Durham a ‘Sanctuary City’ for ALL Illegal Aliens. Since that time, Crime, Gang Violence & other assorted mayhem has plagued our fair city. These above mentioned resolutions / actions taken by our Durham NC City Council, are not only wrong, they are Illegal! They are a direct violation of Title 8, U.S.C. § 1324 — (Alien Smuggling – Domestic Transporting – Harboring – Encouraging / Inducing) . Respectfully submitted by SilenceDogood2010 this Nineteenth Day of October in the Year of our Lord, Two Thousand and Fifteen.